In today's Hit and Run, Jay Jaffe looks at the end of the Blue Jays' win streak, the awakening of George Springer's bat, and the latest Cubs prospect to make it to the majors. The Blue Jays were one strike away from a bit of history—as well as bragging rights—on Monday night, but an 11th-inning rally by the Mets left them short on both fronts. At stake was not only Toronto's first ever win in Queens, where the Jays had gone 0–9 since interleague play began in 1997, but also the team's 12th straight win, which would have set both a franchise record and a 2015 major league high. But the Jays fell short, 4–3, in a loss that left their streak tied with New York's 11-game jag in April for the season’s longest. The ties between the two teams were further underscored via a strong start by former Toronto farmhand Noah Syndergaard and a key error by ex-Mets star Jose Reyes. Via StatCast, the blow left Bautista's bat at 109 mph and traveled 449 feet into the second deck. It was his 12th homer of the season and his first since hitting a pair on June 7 against the Astros. After that homer, the Jays sent three more batters to the plate, as Edwin Encarnacion walked and Chris Colabello singled before Dioner Navarro struck out. From there, however, both Syndergaard and opposite number Mark Buehrle cruised. Buehrle was typically economical, retiring the first 12 batters he faced while using just 41 pitches, with no more than 12 in any inning. His streak of perfection ended when he yielded a double to Lucas Duda to lead off the fifth, and while he worked around that, he got into trouble in the sixth when Kevin Plawecki reached on a throwing error by Reyes, took second on Syndergaard's sacrifice and scored on a double to left by Juan Lagares, who came home just one pitch later via a Ruben Tejada double to right, giving the Mets a 2–1 lead. After his rocky first inning, Syndergaard allowed just one other base runner, sensibly walking Bautista on four pitches in the third, and he added nine more strikeouts, including seven of the final nine batters faced from the fourth through sixth innings. That ran his pitch count to 109, the highest of his seven major league starts and enough to spell the end of his evening after the aforementioned sacrifice. A ninth-inning homer by Bautista on the first pitch from Jeurys Familia tied the score at 2–2, but the Mets' closer—pitching on his fourth day out of five, interrupted by a day off for the birth of his son—managed to strand two other runners. The Jays scored a run off Hansel Robles in the 11th via a walk, a single and a sacrifice fly and had New York on the ropes once Brett Cecil induced Michael Cuddyer to hit into a force out, erasing Tejada in the bottom of the 11th for the second out. With the infield and outfield both shifted to counter Duda, the lefty slugger worked the count full; Cuddyer lit out from first base, and Duda's pop fly into shallow leftfield fell in, allowing Cuddyer to come around to score on a single. One pitch later, Wilmer Flores singled up the middle off righty Liam Hendriks to bring Duda home with the winning run. Even with the loss, the Blue Jays are 34–31; they hadn't been three games above .500 at any point this year prior to the streak. They're now just two games out of first place in the AL East and one game out of a Wild Card spot, thanks largely to an offense that cranked out 8.0 runs per game during the tear and leads the majors at 5.52 per game overall. Given a rotation that lacks a single pitcher preventing runs at a better-than-average clip since Aaron Sanchez hit the disabled list—Buehrle's 97 ERA+ and 4.01 ERA are the best among the current unit—Toronto still has its work cut out to push even higher in the standings, but the team is heading in the right direction at least. After singling and scoring in what became a four-run first inning—capped by Colby Rasmus's three-run homer—Springer extended the lead to 5–0 in the second via his first home run, at the expense of starter Chad Bettis. He followed that with a diving catch of Rafael Ynoa's liner in the top of the third, then laid out again for another diving catch on DJ LeMahieu’s liner in the sixth, though the two runners on base subsequently came around to score with back-to-back singles that cut the lead to 5–2. It was 5–3 when Springer greeted LaTroy Hawkins with his second homer of the night, a solo shot that capped the scoring at 6–3. 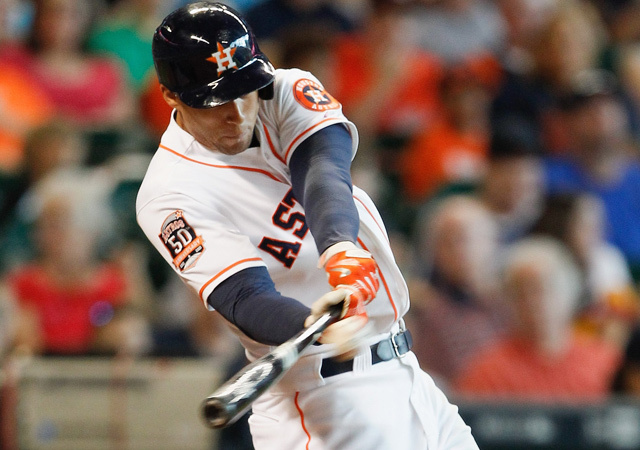 Including a rare 5–0–5–0 line in a loss to the White Sox on June 10, Springer is 16-for-32 with six extra-base hits over his last eight games, but it's fair to ask if he's being put to the best use. Manager A.J. Hinch moved him from third to first in the batting order on May 24, and since then, all four of his homers have been solo acts, accompanied by only three additional RBIs. That said, the Astros' lopsided offensive performance—with a .306 on-base percentage (11th in the AL) and .416 slugging percentage (second)—means that somebody's power is going to waste somewhere in the lineup. Only four regulars—Springer, Jose Altuve, Chris Carter and Rasmus—have OBPs above .289, and that quartet accounts for 35 of the team's AL-leading 88 homers. Meanwhile, Houston's top two home run hitters, Luis Valbuena (14, with a .252 OBP) and Evan Gattis (12, with a .261 OBP), are basically feast or famine. Then again, the Astros appear to have even bigger problems with some of their other hackers. Suddenly, last year’s breach of their Ground Control database makes a lot more sense. No sooner had Cliff Corcoran's rundown of the top 10 prospects still in the minors in the wake of the recent callups of Carlos Correa, Byron Buxton and Francisco Lindor been published than the news arrived that one of them—catcher Kyle Schwarber, the fourth overall pick of last year’s draft out of Indiana University—is headed to The Show. ​Schwarber is currently hitting .320/.438/.579 with 13 homers at the Cubs’ Double A Tennessee affiliate. Once he debuts, he'll be the first position player from last year’s class to do so; pitchers Brandon Finnegan (Royals), Carlos Rodon (White Sox) and Jacob Lindgren (Yankees) have already gotten their feet wet. His stay isn't intended to be a permanent one, however. With five interleague games in Cleveland and Minnesota this week, the Cubs plan to use Schwarber as a designated hitter and bench option, then send him to Triple A Iowa following Sunday's game. Schwarber has the leadership skills and the arm for the position, but his receiving skills are still a work in progress. He did play 36 games in leftfield last year, and while he has yet to play there this season, it wouldn't be a surprise if he sees time in the pasture at Iowa with designs on helping the team in that capacity later this season.